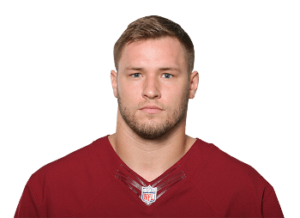 Will Compton signed with the Washington Redskins as an undrafted free agent in 2013. He made his NFL debut with the team against the New York Giants on December 29, 2013 and his first NFL start against the Arizona Cardinals on October 12, 2014. Will has now completed 5 seasons in the NFL. In his 4th season in 2016 with the Redskins, Will became the teams Defensive Captain and part of the heart and soul of the Redskins defense. In 2018 during the off-season Will signed with and is now currently a linebacker for the Tennessee Titans. Off the field, Will is an entrepreneur and powerful keynote speaker. Get ready to take your thinking and belief to the next level. As a former captain at the University of Nebraska, Will has not only been a student of the game of football but a student in life and striving to be his best daily. He empowers audiences to focus on creating a “STANDARD” to live by, in order to turn your dreams into reality and to create your own destiny. In the off season he resides in his hometown of Bonne Terre, Missouri where you will find him speaking to schools and businesses, getting involved with business ventures and giving back to the youth at his football camps in Bonne Terre and in Lincoln, Nebraska.